That “one day” is now upon us. The feat turned out to be the fraud. 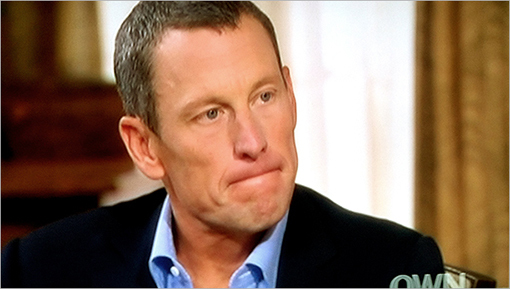 Lance has finally “come clean” – admitting to doping and by default, lying about his past. It does not appear that anyone is too surprised at the admission. What is shocking is the degree of deception and the years of passionate denials. The dust has now settled and we find Lance has lost the only thing he really had left to cling to; his word. That, by the way, is now considered worthless. Such is the consequence of serial lying. For those of us old enough to remember, we flashback to a former sitting President declaring his innocence with all sincerity about the extra-marital relationship he didn’t have. Lies. We recall an emotional husband declaring his innocence with all sincerity about his wife and unborn child and how they went missing. Lies. With disgust, we remember a prominent football coach who declared his innocence with all sincerity and what didn’t happen with boys in the locker room. Lies. Our country’s legal system was based upon the assumption that everyone would be considered “innocent until proven guilty.” It’s becoming harder and harder to maintain that assumption. You hate to doubt every person who ever denies an allegation but we have seen too many people deny too many things too many times to give us hope that anyone under suspicion is telling the truth anymore. The more sincere someone is in their denial the more cynical we can become. Sincerity, it turns out, is an irrelevant indicator of truth – even if it is heart-felt and convincing. The following poem reveals that sincerity, though important, just isn’t enough. Charlie can sincerely believe the liquid in the test tube is water. His sincerity does not change the fact that he is performing a lab experiment with sulfuric acid. Many questions abound after the truth rises to the surface. Too often, we never get straight answers to these questions. Concerning Lance, we all want to know why? Why he lied is obvious but why did he finally come clean? Why did he come clean now and not in the beginning or during his testimony under oath? Why did he lie for so long? Why did he try to deceive everyone at every level, even attacking his accusers now proved justified in their accusations? More importantly, can he ever be trusted again? It’s easy to villianize Lance (and others like him) in the media. We tend to enjoy sitting on our moral high horse and judge the poor decisions of the rich and famous. But truth be told, the only difference between Lance and me or you is that he is rich and famous. Our heart is just as likely to be led astray by fame, fortune and world championships as anyone else. One man is tempted to abuse drugs while another man is tempted to abuse children. One woman might steal clothes while another prefers to steal husbands. Granted, the consequences to some sins are very different and more severe, but the capacity for wrong exists in all people. This was Jesus’ point when the Scribes & Pharisees (religious leaders of His day) brought a woman caught in the act of adultery to Him (John 8). The Law stated that she should be stoned (to death) for her sin. Jesus saw the problem with their approach immediately. None of these religious leaders were in a moral position to judge this sinful woman. None of them (priest and prostitute alike) are worthy to throw a stone at anyone. Jesus gave them permission to stone her… under one condition, “He who is without sin among you, let him be the first to throw a stone at her.” Isn’t that the heart of the issue? Unfortunately, we have not seen the last of duplicitous divas. In a few months, we will forget about Lance as the next celebrity will shock us with his/her tales of living a double life. Another salacious story will grab our attention. Another tale of deception will captivate our minds and appease our lust for sensational news. Hollywood will capitalize on the story for their next movie much like I have used it as fodder for this blog (Sorry Jim!). Deception will continue to rear its ugly head and only the super hero of truth can defeat it. Truth will always beat a lie even if it does take awhile to pin it to the mat. Truth wrestling deception turns out to be a fitting analogy. In the Old Testament, Jacob (whose name means deceiver) had been living up to his name. After deceiving his father and stealing his eldest brother’s birthright blessing (Genesis 27), Jacob was on the run – from his brother and from living a truthful life. By chapter 32, we find that Jacob was “left alone.” That is where those who walk the road of deception eventually find themselves, alone. Mysteriously, a “man” begins to wrestle with him until daybreak. Wrestling a total stranger is a strange thing to do at any hour of the day. But this match began in the middle of the night, certainly an odd time to wrestle anyone. The writer of Genesis identifies the mysterious wrestler as none other than God Himself. God likes to engage His children. He could have challenged Jacob to a game of chess and dealt with him on an intellectual level. He could have challenged Jacob to a myriad of different physical challenges. Instead, He chose to wrestle him. Wrestling is intimate. It is body on body. It is sweat upon sweat. No other physical contest provides as much physical contact. It is just like God to desire that kind of contact with His children. It is just like God to pursue His wayward kids – even in their darkest night. While you are alone in your darkness, He shows up and wants to wrestle. While everyone else is running from you (in pain) or after you (in anger) – God is both brave enough and loving enough to deal with you head on. God knows His children intimately and how to grow us – even if it requires Him to first “touch” us where it hurts. Like Jacob, I spent quite a few years running from others. Many of my decisions have also left me alone, in the dark. As I look around the landscape, there have been no shortage of Pharisees with stones in their hands aimed at my direction. I have done some late night wrestling with a mysterious God and have had virtually every area of my life dislocated as a result. Like Jacob, I will spend the rest of my days walking with a reputational limp… every step reminding me of a past I’d prefer to forget. And yet, in the gritty process I have been blessed. I have received a new identity. I understand a bit more clearer how the Redeemer redeems. Oh, how that Redeemer loves to wrestle – even today. He still dislocates hips. And changes names. And changes lives. And gives a blessing to those who don’t deserve them. May it be so for Lance. A new Lance with a limp.